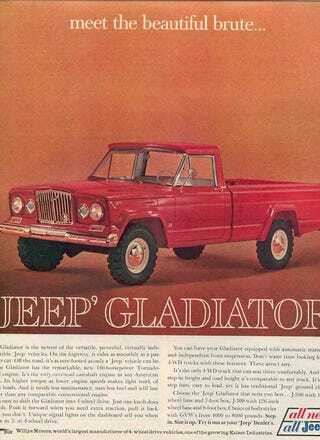 Just a reminder: Jeep Gladiators go way back. It is not technically correct to call all J-series trucks Gladiators, because the name was dropped in 1972, but I do not pass judgment on anyone who cares to do so. I am writing a post on the history of Jeep trucks for Oppo but I’m beginning to think I may not complete it in time for the official unveiling of the new Gladiators, which would make me sad, but there are many trucks to write about and countless details I do not yet know. In the meantime, enjoy this print ad, and please feel free to buy this delightful harlequin Willys that I discovered yesterday, but if you do so, please do not change the color scheme because that would make me very sad.